I don't check the 'this day in history' calendar but on the eve of June 6th I don't need to be reminded that this is the 66th anniversary of D-Day, when Canadian soldiers joined with allied forces and stormed the beaches at Normandy marking the beginning of the end of the 2nd World War. The Royal Canadian Navy provided 109 vessels, and 10,000 sailors as its contribution to the massive armada of 7,000 Allied vessels which went to sea on D-Day. There were 14,000 soldiers to land on the beaches; another 450 were to drop behind enemy lines by parachute or glider. Lancaster bombers and Spitfire fighters from the Royal Canadian Air Force supported the invasion. 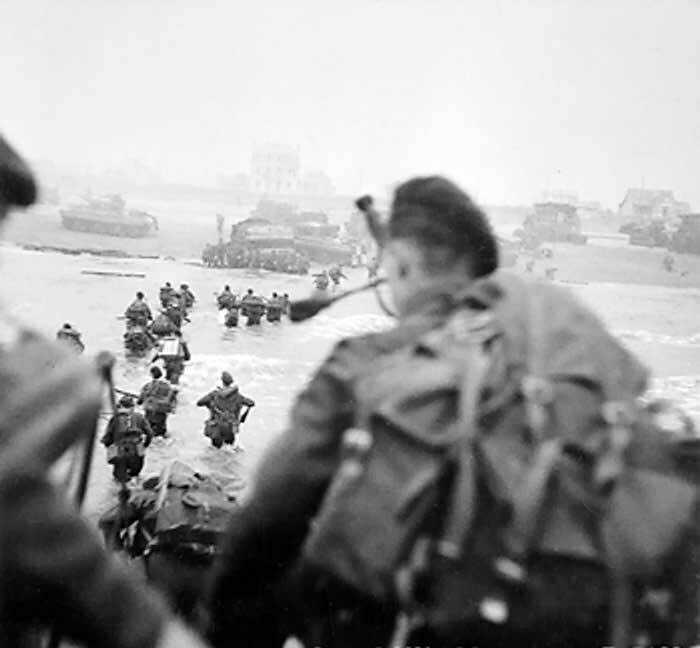 To ensure that D-Day would succeed, 340 Canadians gave their lives that first day. Another 574 were wounded and 47 taken prisoner. Many more would die in those early days of the Normandy invasion as Canadian soldiers established position and survived German counter-attacks. Go check out this terrific archive on the subject courtesy of Canada's public broadcaster. There's really not much to do but be grateful and say thank-you!